Valve positioners can provide process operators with a precise degree of valve position control across the valve movement range, as well as information about valve position. A relationship exists between applied pneumatic signal pressure and the position of the valve trim. The relationship between the two elements is dependent upon the valve actuator and the force of the return spring reacting to the signal pressure. In a perfect world, the spring and pneumatic forces would reach equilibrium and the valve would return to the same position in response to an applied signal pressure. There are other forces, however, which can act upon the mechanism, meaning the expected relationship between the original two elements of pressure and position may be offset. For example, the packing of the valve stem may result in friction, or the reactive force from a valve plug resulting from differential pressure across the area of the plug may be another. While these elements may seem minor, and in some cases they are, process control is about reducing error and delivering a desired or planned output. Inclusion of a positioner in the valve assembly can ensure that the valve will be set in accordance with the controller commands. Each positioner functions as a self-contained small scale control system. The first variable in the positioning process is the current valve position, read by a pickup device incorporated in the positioner. A signal which is sent to the positioner from the control system, indicating the desired degree of opening, is used as the setpoint. The controller section of the positioner compares the current valve position to the setpoint and generates a signal to the valve actuator as the output of the positioning process. The process controller delivers a signal to the valve, and then the positioner takes that signal and supplies air pressure required to accomplish the needed adjustment of the stem position. The job of the valve positioner is to provide compensatory force and to act as a counterbalance against any other variables which may impact valve stem position. Magnetic sensors can be employed to determine the position of the valve stem. 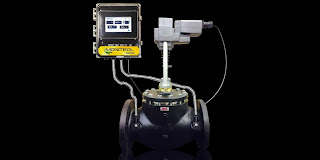 The magnetic sensor works by reading the position of a magnet attached to the stem of the valve. Other technologies can be employed, and all have differing ways of overcoming degrees of inaccuracy which may arise with wear, interference, and backlash. In addition to functioning as a positioner, control valve positioning devices can also function as volume boosters, meaning they can source and subsequently ventilate high air flow rates from sources other than their pneumatic input signal (setpoint). These devices can positively affect and correct positioning and velocity of the valve stem, resulting in faster performance than a valve actuator solely reliant on a transducer. The inclusion of a positioner in a control valve assembly can provide extended performance and functionality that deliver predictable accurate valve and process operation. Share your valve automation requirements with a knowledgeable specialist and combine your process knowledge and experience with their product application expertise to develop an effective solution. actuator in a single integrated package. The final control element used for heating or cooling via a heat transfer fluid is going to be a control valve, most often one capable of modulating the fluid flow by precise valve positioning. This control activity requires sensors, the control valve, a controller, and an actuator. Selecting, installing, and coordinating the operation of these components can be challenging and time consuming, especially when the components are sourced from varied manufacturers. Warren Controls delivers a consolidated solution with their Monitrol line of control valves intended for heat transfer control tasks and related operations. The Monitrol concept involves combining pre-engineered and matched controllers and actuators with flow control valves equipped with built-in sensors for pressure, temperature, or flow. Measurement and control is performed locally, with communications between the local and central controllers exchanging setpoint and performance information. The solution is compact and simplified, enabling easy selection, installation, and startup. More details are provided in the document included below. There are numerous product variants to accommodate a wide array of field applications. Share your fluid control and heat transfer requirements and challenges with an application expert, combining your own facility and process knowledge with their product application expertise to develop an effective solution. Manufacturers of industrial process control gear keep the safety of their customers as a high priority item when designing products. There is much at stake in industrial operations, so every instance where the probability or impact of failure can be reduced is beneficial. Pneumatic valve actuators utilize pressurized air or gas as the motive force to position a valve. 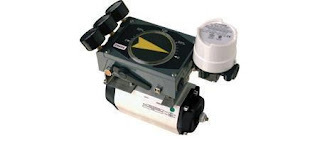 A common version of these air powered actuators employs a rack and pinion gear set that converts the linear movement of air or spring driven pistons to rotational movement on the valve shaft. When one side of the piston is pressurized, the pinion bearing turns in one direction. When the air or gas from the pressurized side is vented, a spring (spring-return actuators) may be used to rotate the pinion gear in the opposite direction. A “double acting” actuator does not use springs, instead using the pneumatic supply on the opposing side of the piston to turn the pinion gear in the opposite direction. From time to time, service or maintenance operations for the actuator may require opening of the pressure containing case. This is a potentially hazardous step and confirmation that the case is not pressurized when disassembly is undertaken is essential to a safe procedure. Many pneumatic actuators have cases assembled with numerous threaded fasteners. 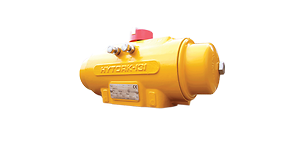 Hytork, an Emerson brand, employs a keyway and flexible stainless steel key to affix the end caps to their XL Series pneumatic actuators. This method provides a number of benefits, not the least of which is preventing the removal of the key and end cap if the case is pressurized. Find out more about the XL Pneumatic Actuators in the illustrated piece provided below. Share your industrial fluid control challenges with industrial valve and automation specialists, combining your own process experience and knowledge with their product application expertise to develop effective solutions.